Disaster Relief Portable, Refugee Camps Solar Light Tower, Solar Light Tower. Used Through Out The United States and World wide by FEMA Federal Emergency Management Agency, DHS Department of Homeland Security, Disaster Recovery Efforts, Red Cross Disaster Relief, European Union, EU Refugees Camps, NATO North Atlantic Treaty Organization, Disaster Preparedness & Recovery. Disaster Preparedness Remote Power Systems, Trailer Mounted Power Systems, Trailer System for emergency and off-grid power needs, Trailer System for Water Purification, Trailer System for Medical Refrigeration, Trailer System for Water Pumping, Trailer System for Water Level Monitoring, Solar Trailer. Used Through Out The United States and World wide by FEMA Federal Emergency Management Agency, DHS Department of Homeland Security, Disaster Recovery Efforts, Red Cross Disaster Relief, European Union, EU Refugees Camps, NATO North Atlantic Treaty Organization, Disaster Preparedness & Recovery. Solar Power for Disaster Relief,Estimated Daily Output: 34Kw. Rated AC Output: 4,500 Watts - 120/240 V/60 Hz - AC Surge: 9,000 Watts. Cutting edge technology in the newest designs. Used Through Out The United States and World wide by FEMA Federal Emergency Management Agency, DHS Department of Homeland Security, Disaster Recovery Efforts, Red Cross Disaster Relief, European Union, EU Refugees Camps, NATO North Atlantic Treaty Organization, Disaster Preparedness & Recovery. 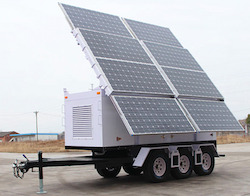 Solar Powered Disaster relief Vehicle Estimated Daily Output: 34Kw. Rated AC Output: 4,500 Watts - 120/240 V/60 Hz - AC Surge: 9,000 Watts. Cutting edge technology in the newest designs. Used Through Out The United States and World wide by FEMA Federal Emergency Management Agency, DHS Department of Homeland Security, Disaster Recovery Efforts, Red Cross Disaster Relief, European Union, EU Refugees Camps, NATO North Atlantic Treaty Organization, Disaster Preparedness & Recovery. 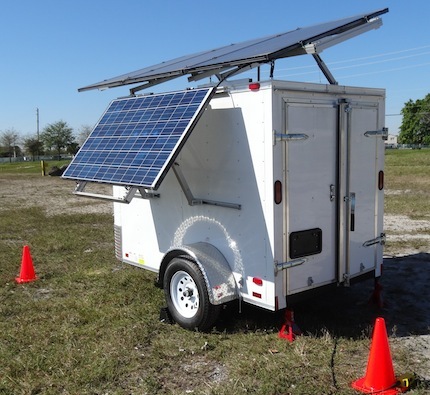 Mobile Solar Power Trailer Provides Power For Emergencies - Estimated Daily Output: 34Kw. - Rugged Military Grade - Rated AC Output: 6,000 Watts - 120/240 V/60 Hz - AC Surge: 12,600 Watts. Cutting edge technology in the newest designs. 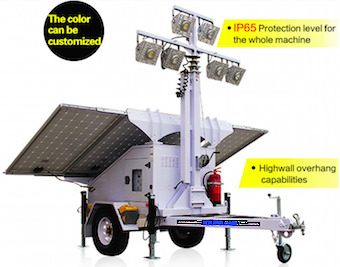 Mobile Solar Power Trailer Provides Power For Emergencies Estimated Daily Output: 34Kw. - Rated AC Output: 4,500 Watts - 230 V/50 Hz - AC Surge: 9,000 Watts. Cutting edge technology in the newest designs. TMPDC® Transportable Modular Solar Powered Storage - Solar Powered Transportable Offices, Estimated Daily Output: 34Kw. - Rugged Military Grade* - Rated AC Output: 6,000 W - 230 V/50 Hz - AC Surge: 12,600 Watts Cutting edge technology in the newest designs.